One of the recruits from Tioga County volunteering to serve in New York’s Third Regiment, Company H, was Horace Hagadorn. According to the National Park Service on-line records, this unit was organized at Albany, N. Y., and mustered in May 14, 1861, for two years’ service. It was known as the “Albany Regiment.” Company H of this regiment was recruited at Owego, Halsey Valley, Richford, Spencer, and Tioga. Briefly, this unit left the State for Fortress Monroe, Va., May 31, 1861, and served there till July 30. This unit moved to Fort McHenry in Baltimore, Md., July 30, and served there until June 6, 1862. Attached to Fort Monroe and Camp Hamilton, Va., Dept. of Virginia. to July, 1861. Dix’s Command, Baltimore, Md., to June, 1862. Mansfield’s Division, Newport News, Va., Dept. of Virginia, to July, 1862. Weber’s Brigade, Division at Suffolk, 7th Army Corps, Dept. of Virginia, to September, 1862. Fortress Monroe, Va., Dept. of Virginia, to April, 1863. Suffolk, Va., 1st Division, 7th Army Corps, Dept of Virginia, to July, 1863. These are two Civil War letters written by Horace Hagadorn of Spencer, NY to his younger sister, Rebecca. Three days after the latter of these two letters was written, Horace fought at Cold Harbor. 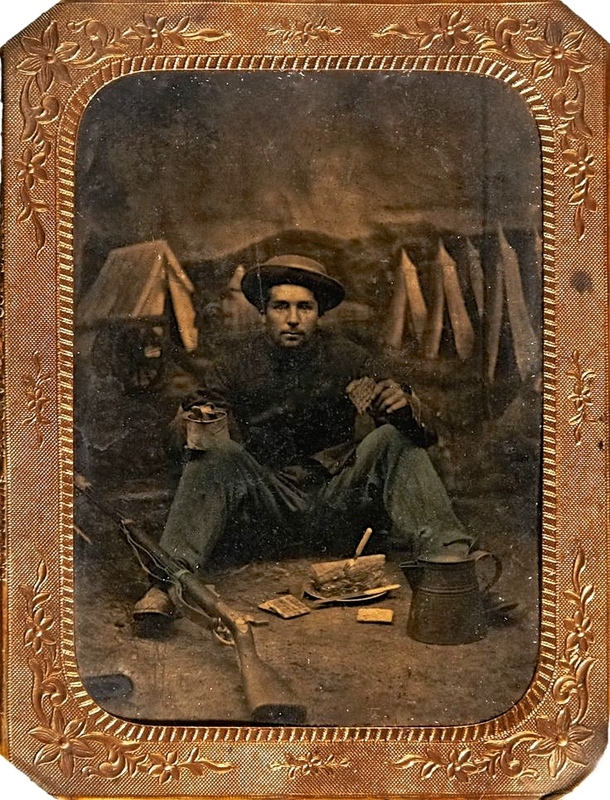 Three weeks later, Horace was killed at Petersburg on June 15, 1864, age 26. He was a full Sergeant Major at the time. Enlisted in Company H, 3rd Infantry Regiment New York on 14 May 1861. Enlisted in 3rd Infantry Regiment New York on 09 June 1863. Though I have written home as frequently as possible to let you all hear from me, none of my letters have been specially to you, for it is impossible to write to all I could wish. This morning is wet, so that we do not come out on drill, which gives a good opportunity to write, which does not often occur. These are no days of rest here except when it is raining and till now there has been but little rain since we came here . There are no war news of importance to write from this quarter but it is thought quite probable that the first great battle may be fought here. Fortress Monroe is a very important position which the rebels would like to obtain possession of. It is the strongest fort on this continent and no force they can send will ever succeed in taking it if it shall be invested by a sufficient force by the government. Active preparations are making to receive them if the first blow is struck here. Troops are arriving here almost every day and more are expected. Batteries and entrenchments are being constructed at several points, one just in the rear of our camp, toward Hampton, so that in case an attack is made by a superior force we can retreat safely to the fort. Still it is my opinion that they never will attack us though of course it is well enough to be prepared for them if they do come. It is not likely that we shall do any fighting unless attacked till some time after the Fourth. Then as soon as a sufficient force is received here and everything is ready, there will be an advance upon Richmond. At least this appears to be the intention now. The weather here has been very hot some of the time, but so far I find I can stand it as well as the best of them. I have been trying my hand at cooking and will tell you something of that. Our company appoints three cooks every week, one chief cook and two assistants who serve for one week. I received the responsible position of Chief, with Lewis Truesdell and Fred Pinney assistants. You will understand that to cook three meals a day for some seventy soldiers keeps one busy. For breakfast we have crackers, coffee, and fried pork, dinner crackers, beans, and beef soup, supper crackers, corned beef, rice and coffee. This is about the regular bill of fare, sometimes we get fresh beef and now we get bread twice a week and tea. The crackers upon which we have lived mostly are not the kind with which we were acquainted at home but regular bricks made to keep in any climate. We have appetites for anything. A week ago we received a nice box of good things from Owego sent to George Stratton, Fred Pinney, and me. The way we feasted on the cake cheese was a caution you can imagine! There are seven of us in a tent here. I am in with the same ones with whom we tented in New York. We have our tent fixed up the most convenient of any tent on the ground, not excepting the officers. Yesterday we thought we would make a floor in it as the ground is sound and damp. So we went outside the lines and tore down a nice board fence and now we have a floor to sleep on. I send you the pass which we had to go outside the guard. We are to have a regimental inspection this forenoon and then will get a month and and a half pay in a few days. I expect to send about fifteen dollars from home in a check on the Bank of Owego. Write to me as soon as you get this. Tell [sister] Em to write and I will write her in a few days. Did you get a couple of photographs sent from New-York? Being in camp resting today the first time in a good while I have a chance to write you a few lines. You need not suppose however from the size of this sheet that it is my intention to write a long letter. We have had active service and a good deal of marching since we left Folly Island. Our regiment was in four days skirmishing and fighting on the Petersburgh and Richmond railroad and the Battle of Proctor’s Creek and Drury’s bluff last week. Our loss was sixty-two men in the regiment the Colonel and our Captain were wounded — I was in the thickest and hottest of it but came out all right. We expect to be at it again in a few days. I received two Owego papers this morning, but have not heard from you in a long time. This entry was posted on Monday, June 30th, 2014 at 6:22 pm	and posted in Uncategorized. You can follow any responses to this entry through the RSS 2.0 feed.